Chris Martin came in for two perfect innings of relief, striking out four of the six batters he saw. The Bats tied the game with a solo home run off Ryan Rowland-Smith in the top of the eighth, but vultured the win when the PawSox scored two in the bottom of the frame. Anthony Carter pitched a one-two-three ninth to pick up the save. Tied 2-2 headed into the bottom of the eighth, Jackie Bradley, Jr. led off with his team-leading 23rd double of the year. The Bats didn't want to take their chances with a red-hot Xander Bogaerts, and gave the phenom an intentional pass. Justin Henry, hitting for Alex Hassan, laid down a sacrifice bunt, giving the PawSox both Bradley and Bogaerts in scoring position. After intentionally walking Mark Hamilton, Louisville retired Dan Butler on strikes. Drew Sutton came through in the clutch, ripping a two-out single to center that gave the PawSox a 4-2 lead it wouldn't relinquish. Sutton was the offensive star, as he'd doubled and driven in a run earlier in the contest, giving him a total of three RBI on the night. Bogaerts was one for three with the walk, scoring both times he reached base. Two members of the SoxProspects.com staff were in attendance. Check out what Director of Scouting Chris Mellen and Managing Editor Matt Huegel were saying about the game on Twitter. Portland continues to slide, losing for the eighth time in its last 10 games. On Thursday the Sea Dogs managed only three hits in a 2-0 loss to the Altoona Curve (PIT). Terry Doyle was outstanding, scattering six hits in seven shutout innings, walking and striking out three apiece. It was the sharpest outing of the year by the veteran righty, but he comes away with little to show for his efforts. The Curve touched up Pete Ruiz for a pair of decisive runs in the eighth. Salem was on the winning side of a pitchers duel, eking out a 2-1 victory against the Winston-Salem Dash (CWS). Mickey Pena continues to provide excellent work for the Sox. In his seventh straight quality start, Pena allowed a run on five hits in seven innings. He struck out five and walked only one. Matty Ott earned the save with three strikeouts in two perfect innings of relief. Salem scored twice despite only three hits. A sixth-inning triple by Henry Ramos scored Sean Coyle, and Matty Johnson came in to score the go-ahead run in the eighth on a Keury De La Cruz sacrifice fly. Coyle was on base twice with a pair of walks, and Ramos was 1 for 2 with walk. De La Cruz continued to slump, with an 0-for-3 night, falling to 7 for 56 in August. It was a devastating loss for Greenville, which had a 2-0 lead in the bottom of the ninth but fell 3-2 in 12 innings to the Augusta GreenJackets (SF). The loss spoiled a phenomenal outing by right-hander Justin Haley. Haley out-pitched Giants 2012 top pick Chris Stratton, giving up just one hit in seven shutout innings. He struck out four and walked only one. In the bottom of the ninth, the walls caved in on Greenville and reliever Austin Maddox. An error, a single, and another error on an attempted sacrifice bunt loaded the bases with nobody out. With the tying run on second, Maddox induced a foul pop for the first out. He got the following batter to ground out to second, but two runs were able to score on the play, tying the game in stunning fashion. The Drive left runners at first and third in both the 10th and 11th innings before Augusta scored the winning run in the bottom of the 12th. Greenville scored only two runs despite numerous opportunities. It had 13 hits and left 11 on base. Kendrick Perkins was on three times, going 2 for 3 with a walk and a run scored. Lowell fell behind early and was unable to close the gap in a 4-1 loss to the Vermont Lake Monsters (OAK). Corey Littrell struggled, allowing three unearned runs on three hits in his only inning. He walked one and struck out one. Simon Mercedes followed and was excellent once again, striking out a season-high of nine while allowing only one run in six innings. In his last three appearances, Mercedes has allowed just three runs in 16 innings, striking out 23 and walking just four. Dylan Chavez added two innings of scoreless relief for the Spinners. There were chances for Lowell, who went 0 for 8 with runners in scoring position. Jose Colorado and Danny Bethea each were on base twice, both going 1 for 3 with an error. 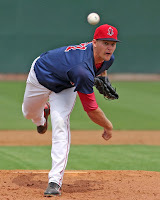 It was a tough outing for Red Sox top draft choice Trey Ball, who was charged with his first professional loss as the GCL Red Sox fell 5-3 to the GCL Orioles. Ball struggled with his control, walking three and throwing a wild pitch. He also allowed a pair of hits, giving up a total of two runs in just two-thirds of an inning. Dioscar Romero entered to a bases loaded jam and induced a fly out to prevent additional damage. Romero allowed a run on four hits in 4 1/3 innings, but also struggled with his control, walking three without striking out a batter. Bryan Hudson carried the offense for the Sox. The center fielder went 3 for 4 with a stolen base, an RBI and a pair of runs scored. It was Hudson's fourth multi-hit game in August. He is 11 for 26 on the month, bringing his average on the season up to .309. The DSL Red Sox lead in the Boca Chica Northwest Division narrowed to two games after a 5-2 loss to the DSL Mariners. Once again, the Sox got a strong starting pitching performance. This time it was Daniel Gonzalez, who allowed just one unearned run on three hits in four innings. He struck out four without issuing a walk. The bullpen could not hold on this time though. Ritzi Mendoza took the loss without allowing a hit. The righty walked two, hit a batter, and issued a balk in a two-run fifth inning. Luis Alexander Basabe was 2 for 4 with a walk. Jhon Nunez scored both runs for the Sox. The first came in the second following a walk, and the next in the ninth after he was hit by a pitch. Player of the Day: Despite not factoring in the decision in Greenville's crazy loss, Justin Haley was superb on Thursday. The season has seen an incredible turnaround for the 2012 fifth-rounder out of Fresno St. In his first seven starts, he was 0-5 with a 6.58 ERA and more walks than strikeouts. After a pair of appearances in the bullpen, Haley moved back into the rotation and has been sterling ever since. He has allowed three or fewer earned runs in each of his last 14 starts, on his way to compiling a 2.31 ERA. In 79 2/3 innings during that span, he has struck out 71 and walked only 37.